For many people owning a vehicle is of great convenience. They allow people to utilize time to the max and give them the freedom to wander the highways. The best part, modern vehicles only need minimal maintenance. Every car and truck will at some point require some sort of maintenance in order to be a safe and reliable ride. While there are some services that will absolutely require the help of a professional mechanic, other services can be done by just about anyone, even the non-mechanical, right in their own driveway. Of course you may need a part or two from the local auto shop. However, if you don't feel comfortable completing work on your own car, it is highly suggested you trust a local auto repair shop to ensure the job is done right. PLEASE NOTE: These suggestions below are typical DIY ideas for older vehicles. For new vehicles it is not recommended that the owner try to perform these services because of the complexity of newer cars and embedded computer systems. Example: Changing your main vehicle battery may cause you some grief because you could end up wiping out some menory in your computer system that controls how the car idles and other functions. Very hard to correct this. RECOMMENDATION: Please bring your late model vehicle in for any maintenance issues. If your vehicle is giving you intermittent trouble starting be sure to check out the battery. If you find any corrosion on the terminals you can clean it off to help resolve the issue. Begin by removing the battery cables. To clean the grit off use a corrosion removal fluid, or you can try baking soda mixed in water, and scrub the terminals and ends of the battery cables with a metal wire brush. Rinse both sides of the connections with cool fresh water and the pat them dry. Now, reconnect the cables to the terminals and hopefully your starting troubles will vanish. One of the easier do-it-yourself auto maintenance services is replacing the air filter. The filter is usually located in a square or round plastic container under the hood. The box is generally held together by metal clamps that often do not require any tools to undo. The replacement process is simple. Just unhook the lid of the container, remove the old air filter and replace it with the new one. Place the lid back on the air filter housing and ensure the clamps are correctly fastened before shutting the hood. For the average DIYer replacing the fuel filter can be a challenging, yet educational experience. In most cars and trucks it is a fairly simple process that will only require a screwdriver, and/or an open ended wrench. 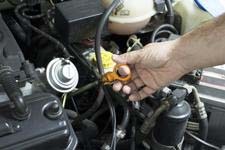 Before you get started you will want locate the fuse that operates the fuel pump. Turn on your vehicle and pull the fuse. The vehicle should turn off if you pulled the correct fuse. This process relieves pressure in the fuel system. Use your owner's manual to locate your fuel filter, as the location can vary car to car. The fuel lines flow in and out of each end of the filter and to replace it simply unscrew the hose clamps on each end, remove the filter and replace with the new one. Some newer vehicles have the fuel pumps inside the gas tank, and this will require much more work and likely the help of an auto mechanic. It feels good to be able to keep you car running great as a do-it-yourselfer. But if you find yourself not wanting to attempt these services or need more complex auto maintenance in Palo Alto or the surrounding area head to The Car Doctor. We'd be happy to talk to you about your car's auto maintenance needs and what you can do to keep your vehicle running its very best. Give us a call at (650) 492-6853 to request an appointment for superior auto maintenance in Palo Alto!